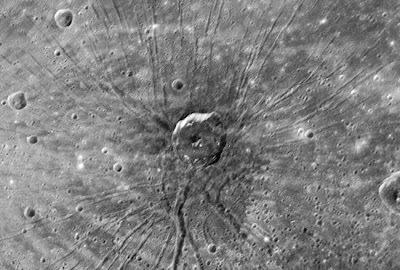 A recent flyby of the planet Mercury from 124 miles (200 kilometers) above the surface has revealed an impact crater with more than 50 twisting roads radiating from its center. But could it be signs of life? "It's a real mystery, a very unexpected find," said Louise Prockter, an instrument scientist at the Johns Hopkins University Applied Physics Laboratory, which built the probe for the $446 million NASA mission. She said whatever event created them "is anybody's guess," but suggested perhaps a volcanic intrusion beneath the planet's surface led to the formation of the 'troughs'. However, the claim will fail to impress the 'life out there' brigade. "They are obviously pathways created by a not too technological civilisation," Noj Luap Nagrom a scientist at Toxteth University astronomy programme claimed. Earth has a magnetic field surrounding it that acts as a protective bubble shielding the surface from cosmic rays and solar storms enabling life to gain a foothold. Astonishingly a peculiar element of Mercury is its magnetic field... added to which the planet has an 'atmosphere'. Scientists are said to be "shocked," having pored over more than 1,200 new images sent by seven instruments on the probe of Mercury's surface. "I couldn't sleep at all," said Robert Strom, a MESSENGER science team member who also worked on the Mariner 10 mission. "I've waited 30 years for this." Does this mean we have at last found life on another planet, and within our solar system? It certainly would raise tempratures.